The University of Texas at Tyler and N-iX collaborated to develop a Virtual Reality solution. The application is set in a virtual environment and is used to enhance educational courses. N-iX team achieved the project goals within the stated time frame (1 month). Our Unity engineers set up Unity Engine and integrated it with Photon Engine to enable online synchronization and multiplayer support. Our 3D artist modeled 3D rooms and 3D objects. The University of Texas at Tyler is a public university in Texas, United States, that offers more than 80 academic degrees. Using VR for learning has become commonplace, and many educational institutions are applying it to their courses. The University of Texas at Tyler contacted N-iX to create a Virtual Reality solution for education and training. The client’s goal was to develop an application set in the virtual environment which can be accessed by many people at once. 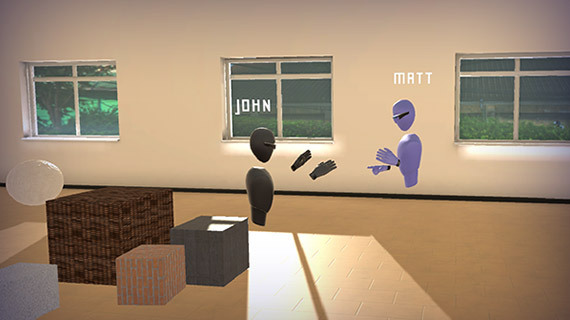 The app features a voice chat inside the VR environment, interaction with simple 3D objects, and simultaneous drawing with a brush in 3D space.